When a tractor-trailer truck careens out of control, it can cause the trailer to whip around, resulting in a jackknife accident. And, when a truck jackknifes with any speed, it has the potential to roll over, all of which can cause catastrophic damage to the trucker and other vehicles on our Kansas City roadways. According to FMCSA 2013 statistics, there were 183 jackknife accidents that resulted in fatalities and 1,000 causing serious injury. A jackknife truck accident refers to a truck with two separate parts — the cab and a trailer — that fold in on itself at the point of separation, swiveling where they are linked together to form an L or V shape. Jackknifing generally occurs because of sudden braking of the truck. A truck going at the normal speed limit that has to brake suddenly can go into a skid where the truck is jackknifed once it comes to a final stop. Accidents involving tractor-trailers and other large commercial trucks tend to be more complicated than an accident between two passenger vehicles. You need an experienced truck accident attorney who can sort through the details and determine causation and responsibility, taking the load off your shoulders. 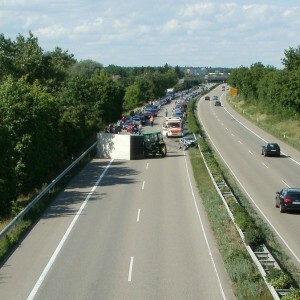 Just because a truck has jackknifed does not automatically mean the truck driver has been negligent. There are other parties that may be responsible, such as the trucking company, depending on what caused the jackknifing accident. The experienced truck accident attorneys at Nash & Franciskato understand the many complex regulations governing truck drivers and trucking companies, along with how to investigate and prove negligence in your truck accident case. If you need to understand your legal options in a jackknife truck accident, you want a trusted and experienced resource who will fight for your rights. In the Kansas City area and across Missouri, contact the truck accident attorneys at Nash & Franciskato for a free, no-obligation evaluation of your case.